Exceptional teaching, outstanding facilities, and wide-ranging academic and welfare support services are central to Global College Australasia’s educational philosophy. The management and staff at Global College Australasia are industry experts who bring a wealth of knowledge and experience to the classroom. Class sizes are small, and the teaching approach is friendly, supportive and personalized. Find out more about our courses or Apply Now by using our Online Application Form. These courses will be primarily delivered in our Training Rooms at the Global College Australasia’s campus. The training and assessment is delivered through theory, role-plays and simulations. Some courses will also include practical training. If the course includes work-based training components, these practical components will be delivered at locations within Perth as work placements, specific for each course. Global College Australasia follows a combination of methods for assessments including written and oral tests, direct observation, role-plays, practical demonstration, projects, simulations and portfolios of evidence. Global College Australasia provides appropriate learner support to all students through its assessment delivery, applying reasonable adjustment to assessment where learning difficulties are experienced by the student. A student will be provided with 2 re-assessment opportunities where an assessment result is found to be unsatisfactory. When a student has not yet gained competency the student will be required to pay further assessment fees for the unit of competency. Global College Australasia training facilities are located at: 176 Wellington Street, East Perth Western Australia, Australia. The facilities include air-conditioned classrooms with internet and computer access. All training is conducted with relevant equipment available to students. 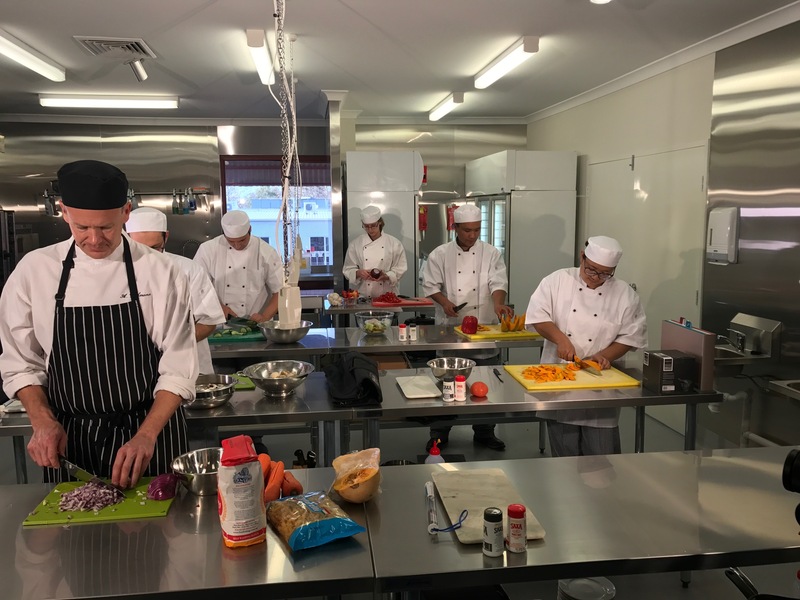 We have the availability of a Commercial Kitchen for our students who are doing the course SIT30816 – Certificate III in Commercial Cookery. Supplementary research materials and resources are easily accessible to students at the City of Perth Library. Located at 573 Hay Street, Perth WA 6000. By train, the Library is about a 15 minute walk from both the Esplanade station and the Perth Underground station. The Red CAT bus stops at the Town Hall which is close to the Library on Hay Street. The Perth CAT service is free of charge. Please contact Global College Australasia’s administration for a detailed breakdown of Study Periods for all qualifications. As per the Department of Home Affairs (Home Affairs) regulations, international students are required to study with a minimum of 20 contact hours per week on a full-time basis. Students are expected to spend an average of 10 hours per week on self-directed study outside the schedule classes. Self-directed study will be monitored through the completion of activities in the Learner Guide and Assessments. Please note that all courses are in full-time mode and cannot be undertaken part time or via distance education. Practical training at workplace placements.